Groups of small crystals of very well defined faces and edges and excellent intense yellow color, on a group of laminar crystals of Albite and with small sheets of Mica (probably Muscovite). Great specimen! Probably one of the best ones ever found. 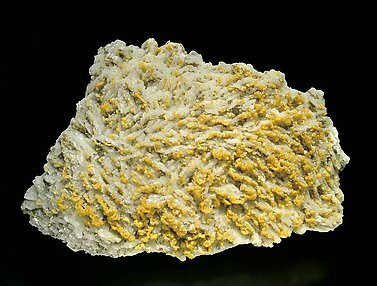 Groups of small crystals, with excellent intense yellow color and well defined faces and edges. All on parallel and “book” growths of laminar Albite crystals. 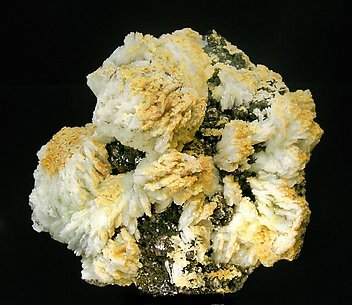 Matrix is coated by laminar crystals of Mica (probably Muscovite). A Museum display specimen.